Generate excitement with an office Halloween party! It’s a great way to show appreciation to employees and clients or make a wicked impression. Here are some tips to help you make it happen. Step one: Create a name and theme like “ghostly gathering”, “spooktacular”, “fright night”, or “thrill fest”. Make the event unique and thrilling. Step two: Décor. Create a scary, fearsome and enchanting atmosphere. Make a lasting impression with logoed Halloween decorations. 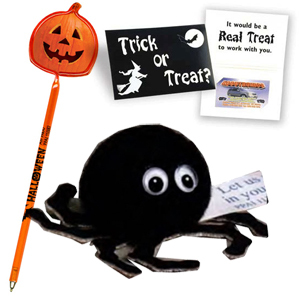 Checkout the Spider Pom Pom Weepul; add it to your centerpieces. Then set the mood by adding mysterious music. Step three: Create a guest list. Send a Halloween treat with invitations to motivate interest. Try the Eerie Ghost Sound Card sounds off when you open the card. Slots to hold your business card inside. Step four: Hold a costume contest with personalized awards and gifts like a custom soy candle or tumbler. Make sure to have a few categories like scariest, funniest and most creative. The Pumpkin Pen and Halloween Lip Balm make great party favors. Step five: Relax, enjoy and mingle with guest. Your enthusiasm will create credibility and stimulation. Source: Successful Promotions “How to Pull Off a Halloween Party” September 2009. Find promotional items, executive gifts, promotional stress balls, trade show giveaways and more at Garrett Specialties.